This section of the site covers specific information for learners/applicants on LCFE's part time programmes running by evening. Just click your chosen option on the menu. 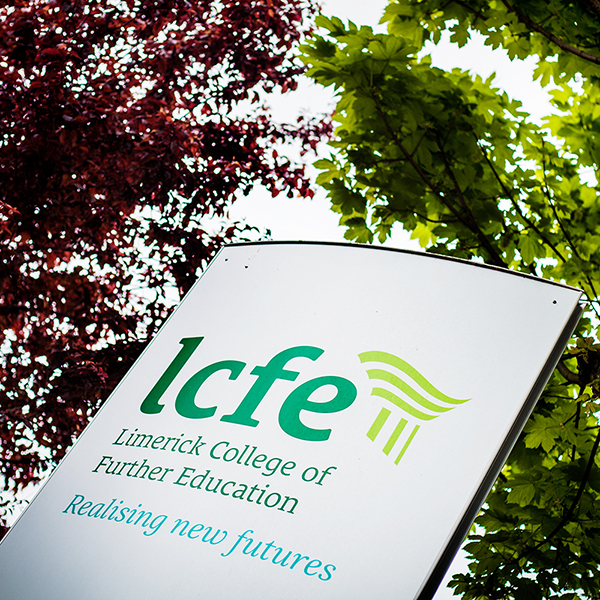 Welcome to Limerick College of Further Education and thank you for considering us as a venue to continue your education. LCFE offers more than 160 part-time evening programmes over many disciplines and currently caters for approximately 3000 learners annually. There is a wide range of relevant accredited and general interest programmes available every September and January. The programmes on offer are reviewed and updated bi-annually, reflecting changing demands and feedback from learners and industry. Our evening programmes support those in employment or seeking employment and provide others with the chance to explore new pursuits. We regard learning as a lifelong pursuit and see education as an important step in the adventure towards greater personal development and growth. LCFE is both flexible and adaptable in meeting the needs of adult learners and provides programmes and expert tuition over many fields of study with accreditation by a number of prestigious validating bodies. We are delighted that you have visited our website and invite we you to join us on a programme of learning at the College. Since 2013 Further Education and Training has been recognised as the fourth pillar of the Irish Educational System. SOLAS, as an agency of the Department of Education and Skills (DES) has been tasked with creating a world class integrated FET sector that is responsive to the needs of learners and the requirements of a changed economy. Within this environment LCFE will continue the tradition of developing more educational opportunities to reflect the diverse needs of adult learner here in the Mid-West region. Due to the popularity and expansion of our range of programmes LCFE has scheduled a number of them at the Further Education and Training Centre, Kilmallock Rd. 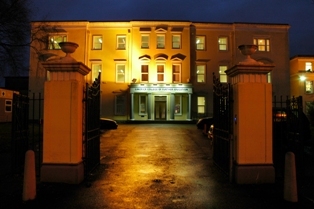 campus (formerly St Enda’s). There are also a range of evening programmes available in our second facility at Cappamore, which you can also see in this site. We will continue to endeavour to expand the range of programmes available to learners in LCFE, demonstrating our commitment to providing the widest variety of learning opportunities in the Mid-West. LCFE supports its teaching and learning with up-to-date resources reflecting business standards and local industry needs. Our greatest asset and key to our success is our staff. They are dedicated, professional and committed to the learners who come here. and explore the full listing of our programmes and prices. This booklet provides you with an overview of what LCFE has to offer and our website provides many of the answers to your queries. You can also follow us on Facebook, Twitter and LinkedIn. The contents of this site are for information purposes only. No guarantee is given that the programmes, syllabi or fees may not be altered, cancelled or otherwise amended at any time. Please note, registration for January 2019 part time courses are open. Register online for the programme of your choice by clicking on the “Part Time Apply” button on the right of the screen and following the simple step by step registration process. NOTE: For convenience it is possible to register for all of our programmes that are available at both campuses at either Mulgrave Street or Cappamore. Fees published in this website are tuition fees only, except where otherwise indicated. Some validating bodies charge separate registration/examination fees. Please refer to their respective websites. Proof for a discount will not be accepted once a programme commences. No discounts are available once a programme commences. Discounts cannot be applied for through the online registration system. Application forms cannot be processed nor places reserved without the full payment of tuition fees. Cheques, bank drafts or postal orders should be made payable to Limerick and Clare Education and Training Board (LCETB). For Security Reasons WE CANNOT ACCEPT CASH. For a programme to commence it is necessary to enrol a minimum number of participants. If this number is not reached the programme will be cancelled. Participants will be notified and a full fee refund will be processed. Any fees paid by cash are refunded by cheque and will require some time to process. All other programmes must remain viable and be self-financing; therefore, NO REFUNDS, under any circumstances, are available once a programme commences. We regret we cannot entertain any other requests for refunds. Once a programme commences participants cannot defer their place on that programme to another term. It is the responsibility of the participants to inform themselves of the programme commencement date, content, programme duration, etc. In all cases fees must be paid before classes commence. Under no circumstances can learners attend a class without an official receipt. Applications received after the commencement date of a programme will only be accepted at the sole discretion of the Adult Education Department. Unfortunately, we cannot facilitate applicants who wish to defer a registered place, either before or after a programme commences, to another term. See Refund Policy. Certificates of Attendance are posted to respective learners within two months of programme completion. Certificates of Attendance are only issued where a learner has 70% attendance on the programme. Replacement Certificate: A replacement fee of €20 will apply for the re-issuing of a certificate of attendance. Any learner wishing to avail of this must contact the Adult Education Department at the commencement of his/her programme. Details on the procedure for examination accommodation will be provided on week one of the programme. Applicants will be requested to submit details of a professional assessment outlining their disability/learning difficulty. Applications made to the Adult Education office after the third week of the programme may not be considered. This applies to written examinations only. Course work will not be returned to learners once submitted for assessment. Learners are therefore advised to retain copies of all course work submitted. This is necessary both for the learner’s own future reference and in the event of the tutor requesting a copy of the course work, for whatever reason. Electronic back-up copies should also be retained. All hard copy materials will be disposed of by 30th September of every academic year. It is the responsibility of the learner to register for all relevant examinations and pay the appropriate examination fee. Examination entry fees are non-refundable. Projects cannot be accepted after the specified dates. These will be located on the examinations’ notice board located on the ground floor and on the Adult Education notice board on the top floor. Assessment entry with QQI requires learners to supply the Adult Education Department with a correct PPSN, first name, surname and DOB. Failure to supply the correct details will result in the unsuccessful processing of the entry. Throughout the duration of the programme learners will be asked to verify their data by their teacher to facilitate the entry process. The data will be used for the purpose of assessment entry only. Other validating bodies have their own time frame for the issuing of results and certificates. Please consult their respective websites or contact the examination officer for further details. There are two learner photocopiers available for evening learners. The library is open from Mon – Thurs, 6.15pm – 7.15pm; check library notice board for daytime opening hours. Learners need a LEARNER ID card to use the library facilities. These cards are available in the library at a cost of €5. You require a passport photograph to receive a LEARNER ID card. LCFE is constantly updating its computer facilities and currently has 9 state-of-the-art Computer Rooms including an Apple iMac laboratory. All are networked and connected to a high-speed internet connection. The canteen opening hours are Mon – Thurs, 8.00am – 9.15pm. Learners are not permitted to use images of the College or its staff or learners or persons within the vicinity of the college without written authorisation from the Director of Adult Education. Learners Undertaking Hair, Beauty or Holistic courses must adhere to the guidelines and procedures outlines by the certifying body eg A learner where required must agree to wear a uniform as specified and required by the certifying body and may need to supply their own Model(s) to successfully conduct the practical elements of the course and satisfy the on-going assessment requirements of the course. Learners must adhere to all health, safety and hygiene requirements of practical courses as specified. All models for Hair, Beauty or holistic courses must be over 18 years. There are some exceptions for Hair courses where a model must be over 16 years. The college does not provide parking facilities to learners. It is the learner’s responsibility to park legally if they are parking in the surrounding areas. If there is sufficient interest a local car park may offer parking at a very competitive rate. The campus provides free parking to all learners on the college grounds. LCFE are not responsible for loss or damage to any motor vehicles or property contained in any motor vehicle while parked on the premises. Motor vehicles are parked entirely at owner’s risk. 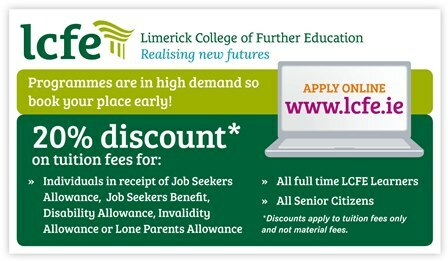 A number of LCFE’s part time programmes now take place at the Further Education and Training Centre (formerly St. Enda’s community school) on the Kilmallock Road. The campus boasts great facilities and has ample free parking spaces available. The college needs to be informed of any change of address to ensure the prompt delivery of all correspondence, examination results, certificates etc. This can be emailed to: adulted@lcfe.ie. The college is not responsible for any delivery delays or non-delivery caused by a third party. Learners wishing to appeal their received final result or any aspect of the assessment process must complete this form and return it and a fee of €40.00 per appeal to LCFE before the specified date. Responsibility cannot be accepted for the loss or damage to the property of the learner. Due to unforeseen circumstances e.g. teacher illness; a class may be cancelled and rescheduled to another date. If sufficient notification has been received by the college, a text message will be issued to all learners registered on the programme advising them of the change. A cancelled class will usually be rescheduled to the week following the last week of the programme, at the normal time and day. However where this is not possible another date will be selected. On rare occasions it may be necessary to reschedule a class because of a bank holiday. Learners must provide a valid mobile number when they register to study with LCFE Evening School. LCFE/LCETB is committed to practices which safeguard the welfare of learners, young people and vulnerable adults. LCETB is registered with the Garda Central Vetting Unit and will be conducting Garda Vetting on learners attending programmes where it is identified that possible interaction with children and vulnerable adults is a feature of the programme. Any information disclosed by the Garda Central Vetting Unit may be shared with the appropriate decision making personnel in prospective work experience organisations. It is the learner’s responsibility to ensure that all information is correct, as any omission will mean a delay in the processing of the application.